The village is situated 40km southeast of Pécs. After the defeat of the Imperial Army over the Ottoman Army at the foot of Mount Harsány in 1687, the Imperial Chamber seized Nagynyárád. In 1699, Prince Eugen of Savoy was awarded Bellye Manor and Nagynyárád for his military services. Since the manorial lord passed away in 1737 without heirs, the manor went back into Habsburg ownership. At the end of the 17th century the area which had been largely depopulated under Ottoman rule was inhabited by a number of Serbian families and few Magyars. The village had already been sporadically populated through German colonists as early as 1715 and large-scale settlement had taken place between 1720 and 1723. 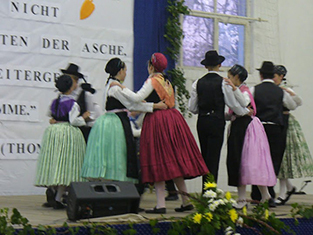 The first colonist families came from the diocese of Fulda. In 1729, the village had 280 inhabitants and the population number rose steadily over the next decades, and when Bishop Klimo visited the village in 1757, 828 believers lived there. The orthodox Serbs had left the area early on and only the field name "Ratzkipfl" at the western border of the village is reminiscent of their former presence. After World War II, more than 600 Germans were displaced from the area. Those remaining were disfranchised and dispossessed. 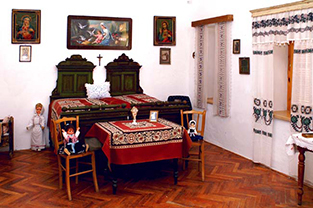 Due to the Beneš decrees, displaced Magyar families from Czechoslovakia and Magyars from different Hungarian regions were situated in the Germans' houses. This did not only result in the destruction of the lingo-cultural homogeneity, but also in a religious separation, since the Magyars were Calvinist reformists. A visit of the local cemetery is recommended. 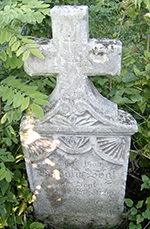 The changes in language on the tombs since the mid-20th century illustrate the drastic effect which the dispossession between 1846 and 1848 as well as the displacement of Germans from Hungary had on the local German community. The joint memorial of Germans displaced from Hungary and Magyars displaced from Czechoslovakia after the Beneš decrees is unique in the whole of the Carpathian Basin. The memorial is located on a small square at Táncsics Street 30. On this square, commemoration events in German and Hungarian take place each year on the 23rd of October. 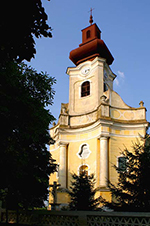 The church, which was erected between 1756 and 1763 in honour of the Virgin Mother, is the most extraordinary artistic site of the village. The baroque building is ascribed to architects from Vienna. According to the traditions, Maria Theresia ordered a church to be built on public expenses in seven villages after her seventh child was born. Nagynyárád was the northernmost of these - and the only one which is located in Hungary today. 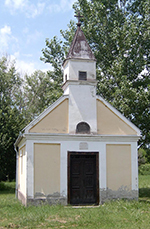 The six other churches are situated in villages in the Danube-Drava region in today's Croatia. LEFT: The church which was erected in honour of the Virgin Mother between 1756 and 1763. 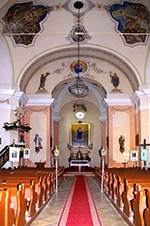 RIGHT: Interior of the baroque church. LEFT: The chapel of Saint Wendelin on the western end of the so called "Altgaß" ("Old Alley") in Nagynyárád which was built at the end of the 19th century. RIGHT: Tomb in the old cemetery. 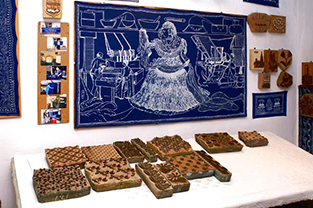 The workshop of dyer János Sárdi made the village well known beyond the borders of the region. The instruments necessary for traditional dying with dyer's-weeds as exhibited here and practical demonstrations show how they were used. A museum of local history which exhibits typical interiors and costumes of the German population in the first half of the 20th century. The Dyers' Festival is traditionally held each year on the third weekend in July. Two days of festivities which are celebrated with culinary treats, music and dancing.